None of this analysis is to argue that CCCS should not try to establish a fully-online college. The goal of better serving nontraditional populations – adult students with and without jobs – is worth pursuing on its own merits. Accepting that best case this approach probably recovers less than 10% of the enrollment drop since 2009. We have literally tens of thousands of working adults with some college and no credentials and a couple of million working adults who are unemployed or underemployed,” Oakley said. “This is a wonderful opportunity to reach a population that really needs a community college to achieve economic mobility. So it's worth looking at what other options may be available to address this goal. 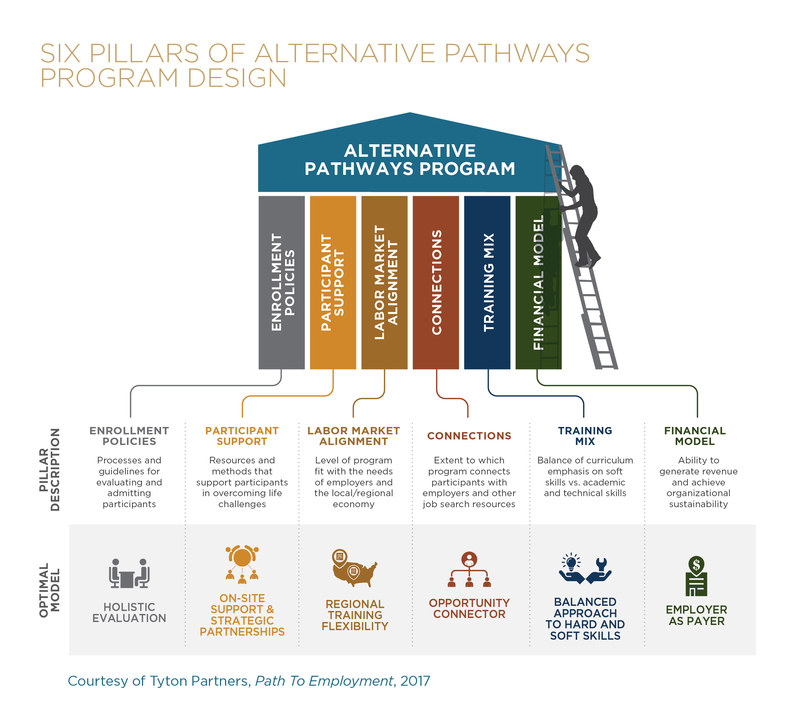 Fortuitously, Tyton Partners recently released a two-part report funded by The James Irvine Foundation called Path to Employment: Maximizing the Impact of Alternative Pathways Programs. [Registration required.] It provides a framework for analyzing the potential and critical success factors of shorter, non-degree and non-certification programs. There are various trendy Sillycon Valley buzzphrases associated with these sorts of programs, like "code academies," "boot camps," and "micro-credentials," but they all fall under the broader heading of a term that has irrationally negative connotations in the United States: "vocational education." For the purpose of this blog post, I am going to use vocational education and Tyton's preferred term—Alternative Pathway Programs (APPs)—interchangeably. Tyton's report provides an interesting general framework looking at how to think about these types of programs' abilities to address the needs of non-traditional students, with a special focus on the state of California. It's worth taking some time to examine aspects of the report in detail. I can't say for certain whether that definition is one that Chancellor Oakley or Governor Brown would accept for the group of people they are trying to help, although I suspect that there is at least a strong overlap. For the remainder of this post, I will use the term "low-income adults" as defined by Tyton, since their analysis is built on that definition. There are approximately 7 million people who fit that definition in the state of California, "which accounts for nearly 37% of the state's entire workforce," according to Bureau of Labor Statistics numbers cited in the report. That's a big number. How many of those people are touched by various educational programs? That grey space represents all the low-income adults in California who are receiving...nothing. But it's actually worse than that in several ways, as Tyton points out in their report. First, not all of the 2.1 million California community college students fit the definition of "low-income adults." Second, the average community college graduation rate is low. Nation-wide, it's less than 30%.2 Particularly for low-income adults, going to school, incurring debt, and not getting a degree is worse than nothing. This brings up a second data fidelity problem, since one does not necessarily have to complete a degree in order to gain economic benefit from coursework. A worker could go back to school for a couple of accounting classes that enable her to get a better job, for example. One person's degree non-completion is another person's alternative pathway program. So the numbers Tyton uses as proxies for impact potentially both overestimate the number of low-income adults that California community colleges reach and underestimating the percentage of those it reaches that it economically impacts in a net positive way, although they are accurate enough for Tyton's goal of painting a broad-brush picture of the magnitude of unmet need. More on the data issues later. So we have a severe problem of scaling access, even in a state that is historically known for its heavy investment in education. Even if a new online community campus were created and, under Phil's most optimistic scenario, added another 20,000 enrollments over the next 10 years, that's a drop in the bucket even before you consider that not all of those students would fit the "low-income adult" definition and it's possible that considerably less than half of them would graduate. And this gap persists in spite of California spending "roughly 2.5% of the state’s entire annual budget" on educational programs for low-income students, according to Tyton's figures. [E]ven if all the spots within [community colleges and the two other identified types of] programs were allocated to low-income adults seeking to enhance their employment prospects, current capacity would support less than a third of the potential annual demand. Expanding the number of successful models that can support education-to-employment pathways for adults is imperative, both from within the current ecosystem of institutions and workforce programs and through new, innovative program models. Most APPs focus on recruiting and serving participants directly, similar to colleges and universities, but they vary widely in their training model and program length, among other attributes. Some program models connect participants directly with employment opportunities. For example, the high-profile technology, design, and data “boot camps” o er a career-fair job connections model and last less than 12 weeks on average, while experiential learning programs such as apprenticeship programs prepare participants over a longer period (most are 6–12 months long) for a specific career path. Other programs do not connect participants with jobs, but they still offer training for specific career pathway and offer a certification or credential upon completion. Another set of programs focuses on general education as a baseline for specific career pathways, including programs or courses that help participants gain postsecondary credentials or learn general skills. The people in that space are not currently being served by programs that address any of those goals. Tyton asks two basic questions. First, to what degree might APPs—many of which do not currently serve low-income adults—be recruited to fill in some of that grey space? And second, what are the characteristics of an APP that would make it most likely to achieve this goal? The first question can only be answered in a fairly general way, since we have no systematic tests of it yet. Tyton spends the bulk of their report on the second question by analyzing patterns across over 125 existing APPs. I am not going to provide a detailed critique of Tyton's analysis framework in this post. Rather, I'll be examining the ways in which having such a framework enables more productive and nuanced discussions addressing big educational problems like helping low-income adults using tools ranging from policy to educational technologies. In and of themselves, there's nothing earth-shaking about these categories. But stating them explicitly as part of the analytic framework enables us to do all kinds of additional important work. First, it enables us to ask, "Is this a complete and plausible list of critical success factors for a vocational program?" For example, the work of Vincent Tinto and others connects students' sense of belonging in campus community to their likelihood of completing their degrees. Is that principle also operative in vocational programs for low-income adults? If so, how much of an effect does it have? And can it be subsumed under "participant support," or is it distinct and important enough to merit its own pillar? The point of the hypothesis is to have a truth proposition that can be tested. For example, Tyton has listed "employer as payer" as the "optimal model" for vocational programs. Going back to Governor Brown's online campus proposition mentioned at the top of this post, California has funding mechanisms at its disposal that many of the start-up programs examined by Tyton do not. One might float an alternative hypothesis for that pillar and then test that hypothesis through various means. But these models don't exist independently of the other pillars. If your program has an enrollment process that is extremely good at identifying students who come to the program already possessing many of the skills and life circumstances that would enable them to succeed if only they were given the opportunity, then you may need less investment in participant support. Conversely, if the program's goal is to help those students who have to face the most daunting obstacles to their education, then investment in support becomes more important. This brings us to one of the most deeply divisive terms in education: scale. The Tyton report examines two types of scale: inputs and outputs. Access and outcomes. Let's imagine that California were somehow able to get 100% of low-income adults enrolled in community college degree programs. That would be good, right? Well, maybe. Let's also suppose that, in doing so, California's degree completion rate settles at the national average of 30% for community colleges. 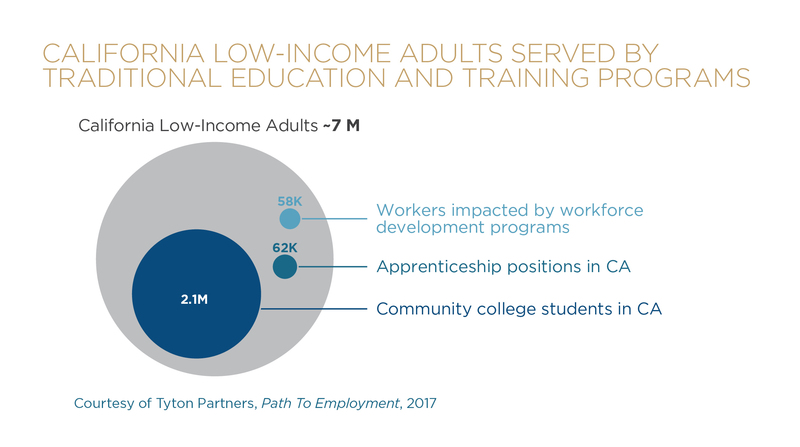 That would mean 70% of California's low-income adults would end up still without a degree and still (likely) without improving their economic prospects. To the contrary, many of them would have increased levels of debt they would have to pay out of their unchanged salaries. So no, scaling access is not inherently good. If a chosen strategy for a pillar has a downward-pointing red arrow, then it presents a challenge to scaling access. On-site support to students is harder to provide to many students than providing students with no support. 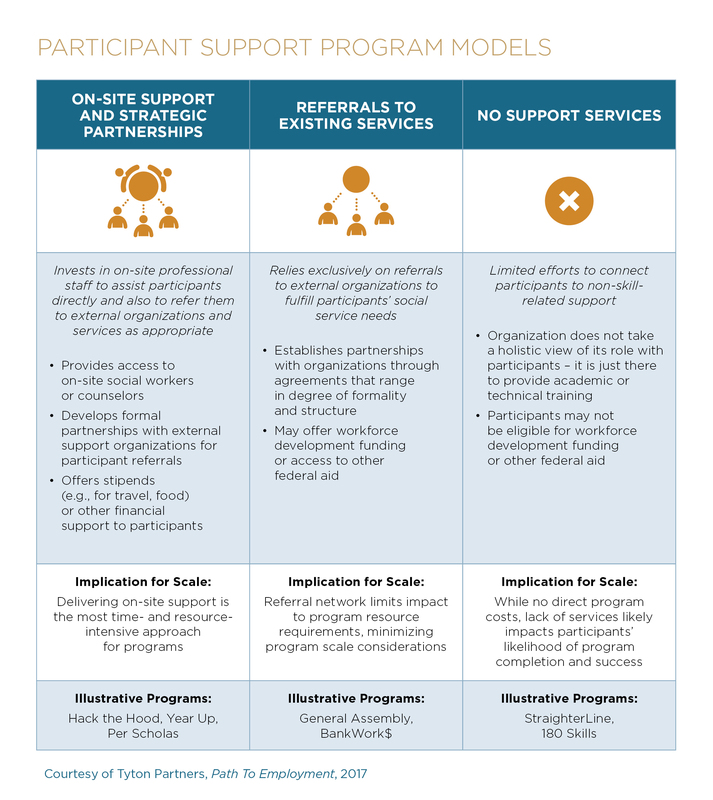 It's harder to scale enrollments—access—for a program that commits to high-touch student support. Then why do it? Hopefully because it improves the percentage of degree completions and other positive outcomes. Taken together, the elements of Tyton's framework give program designers and policy makers both a set of knobs they can turn in an effort to tune a particular program to the needs of a particular student population as well as a lens through which they can examine, test, and refine their assumptions in ways that will improve the effectiveness of those knobs and our knowledge of how the various settings interact with each other. Of course, having knobs to twiddle is good, but being able to measure the impact of your knob twiddling is critical. As I mentioned earlier, the numbers Tyton cites for community college impact on low-income adults are less than perfect measures. While adequate for the purpose of assessing the order of magnitude of unmet need in a large state like California, the two proxies the report uses for scale or access and outcomes—number of students served and graduation rate—are not great for measuring impact at a more granular level. And it will be tough to develop better ones. Going back to the example of the person who takes a couple of accounting classes at a community college and gets a better job as a result, how would one capture that? And yet, that is precisely what we would need to do to get clearer sense of the degree to which community colleges are currently serving the needs of low-income adults and the degree to which tweaking community college programs in various ways might increase that impact. Other APP efforts will likely face similar data quality challenges. So application of the model in practice will likely require some innovation around measurement in these areas. But here again, having a holistic model can help. Tyton highlights sustainability as the big reason to think about employer-pay business models. 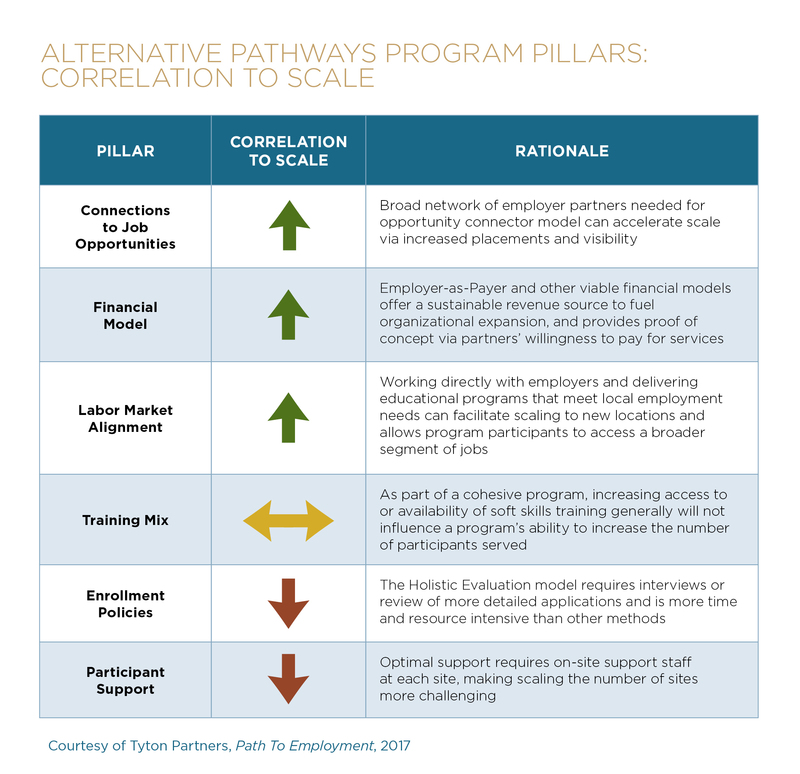 But if you happen to be thinking about the data problem while looking at the Tyton pillars graphic, it might occur to you that a direct relationship with employers can help with that problem. To start with, employers' willingness to pay might be a good proxy for career progression benefits that students gain from their participation in the program. One would have to do the research, but it's a plausible hypothesis. Second, the closer relationship with the employer makes outcomes data easier to get, perhaps in the form of anonymized aggregate data from the employers or by providing richer, longer term relationships with students that give them more incentive to provide the school with post-graduation follow-up data. Nowhere does this framework explicitly address ed tech as such. And yet, ed tech decisions both large and small are often made by directly connecting a problem with a technological solution. A state wants to help reach more non-traditional students. Online learning can reach more students. So why not start an online learning program? A foundation or a college wants to help more first-generation college students make it through college. Adaptive learning programs seem to help some students in developmental math programs get past that stumbling block to their degree completion. So why not invest in adaptive learning programs? Absent of a richer analytic framework, these efforts are more likely to fail and less likely to be reproducible because they don't start with either a holistic understanding of the needs of the students the efforts are trying to help or a clear understanding of how various aspects of the support ecosystem interact with each other. Without a theoretical framework, you can't construct a clear hypothesis. Without a clear hypothesis, you can't construct a proper experiment. Without a proper experiment, you can't learn what works and what doesn't. I have no strong opinions about the answers that the Tyton paper arrives at, but I do believe that they are asking roughly the right questions in roughly the right order. As a field, we need more of this type of program- and policy-level research and analysis to inform a wide range of strategic decisions, including but not limited to use of ed tech. It is an exemplar of a genre of educational research that we should be looking to grow, propagate, and use to inform practical decision-making. This post is part of our Research in Translation series, which is funded in part by the Bill & Melinda Gates Foundation. The findings and conclusions (or views) contained within are those of the authors and do not necessarily reflect positions or policies of the Bill & Melinda Gates Foundation.